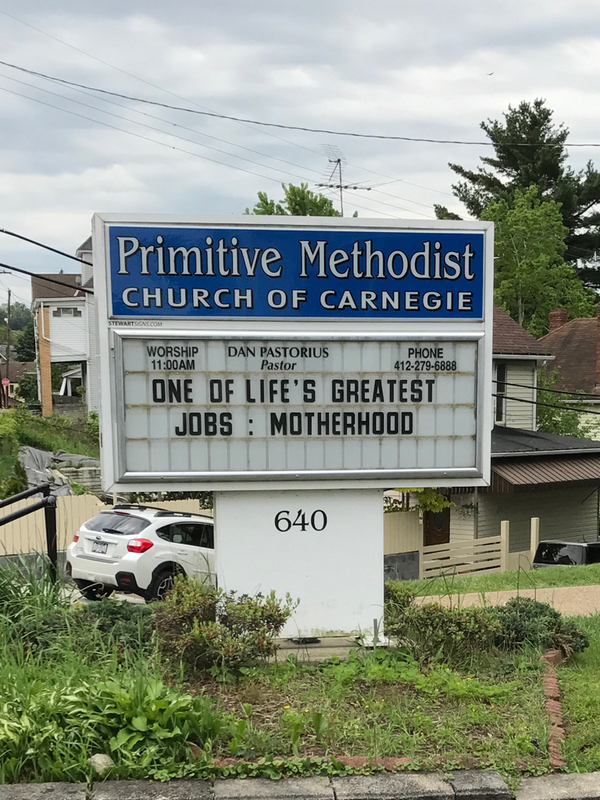 When we traveled to Pittsburgh in May for my mother’s funeral, we also attended services at her church: The Primitive Methodist Church of Carnegie, PA. It’s a tiny church with a small but lively congregation. It was Mother’s Day, and the praises offered by the members of the congregation and echoed by the minister in his sermon, were mostly in memory of the women in that church, and how they collectively raised us. The list included all of my Sunday School teachers, as well as my mom and my grandmother. In fact, several times during the sermon, it occurred to me that that church was home to the few life experiences I have in common with my mother. She grew up during the Depression, my brother and I grew up in relatively comfortable, albeit chaotic times. She ended her education after high school, but helped put both her children through college. She never lived more than a dozen or so miles from the town that church is in. I moved coast-to-coast twice and settled 500 miles away from Pittsburgh. 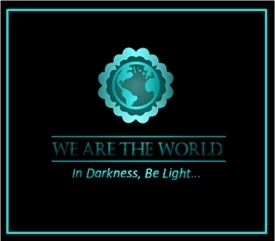 I could fill this blog with the differences in our life. On the other hand. We both grew up in that church. We both sang with gusto, if not ability, all the verses of all those hymns, even the ones we didn’t like – I’m looking at you “The Old Rugged Cross.” We both stood in that small room and accepted Jesus Christ as our personal savior, as we became Junior Members at age 13. My hand was probably raised a bit more timidly than hers had been 30 years earlier, but it was raised. A few miles west of the PM Church is St. George Orthodox Church, the church my other grandmother literally helped build. I didn’t spend a lot of Sundays in that church, but I spent a lot of time with my grandmother. She was a woman of faith like none other I’ve ever met. While she probably wished my father had taken us to his church more often, she frequently told me that she was glad my mother took us to church. My aunts (on both sides) regularly reinforced the importance of a strong faith in God, and what that meant with respect to your actions here on earth. These women taught us right from wrong. They taught us by rote and they taught us by example. They set us on a path that ran between boundaries we would not cross in our lifetime. No shortcuts. No diversions, and remarkably, for all those women, no turning back. All of those women are gone. None of them were saints, but they all carried their faith through their final days. Hopefully, that will be one more thing that I share with them. St George Orthodox Church. My grandfather helped build this church, My grandmother attended as long as she lived. A gray day but no rain. Me and mom, about a month before she passed away. This post is part of the Cherished Blogfest. The blogfest is hosted by Damyanti Biswas, Dan Antion, Cheryl Pennington, Peter Nena, Sharukh Bamboat, Mary Giese, and Kate Powell, Paul Ruddock, it is open to anyone who wants to tell the world about something or someone they cherish. If you want to join us, click here. The blogfest is open until Midnight Sunday. What a wonderful tribute to some amazing women! Love your photos Dan. Thanks Ritu. Those women were all special. Thanks for sharing this tender post. I think we can all agree their faith lives on through you. Aw, thanks for saying that. I think they’d be happy to see that. Thanks Sandi. My mother’s mother liked that hymn. My mom didn’t. Ironically, it was playing in the background at the funeral home the day of her service. I’ve written before about my dad’d mother. She was very special to me, and she taught me a lot about life. Thanks Hilary. I think we were lucky to have so many women around who really cared about us. Thank you, Gwen. I’m glad you enjoyed this. Thanks Judy. Those lessons and those memories do travel with us. I think those women worked to make sure they would. I’d thought about it before, but listening to all the other people, who were my age, talking about the different women who “raised us” really made me realize how large a role those women had in our lives. I’m glad you enjoyed this. Thanks for sharing such moving memories, Dan. You are one of the humblest people I have ever met. Thanks for hosting the Blogfest. Thanks Peter. It’s hard to look back and honestly take much credit for getting this far. It’s not like I would have gone very far on my own. This is a wonderful tribute to your mother, the women of the town and the village itself. That generation gave us so much. The pictures today compliment your memories. Thanks. That generation really did give if themselves. I’m not sure we did such a good job carrying the pail after they set it down. I think of my childhood and the fact that they had lived through the depression and WWII and all they wanted was to make a better life for us. It’s hard not to be humble. Indeed. Maybe we were spoiled. Dan, I love your post and I admire your mom, grandmother and aunts for having such conviction in their faith. I aspire to that conviction every day…still a work in progress. It was awesome of you to share these two churches (I love the small ones) and the story of the women in your life that taught you faith and goodness. Thanks for co-hosting the blogfest, I truly enjoy the stories that come from this annual event. Thanks Mary. I knew when I was standing there that I needed to share that story, but I wasn’t sure how or when. This seemed like the right time. Those two churches couldn’t be more different, but the same kind of people were inside. These are the memories that sustain us. Beautiful tribute. Thanks Pam. I think you’re right. I was raised without a mother in the home from 7th grade on. I looked towards the women of my church for guidance. I secretly watched them and tried my best to emulate them. I’m once again back at my childhood church as an associate pastor full-time. Indeed full circle. Lovely post, Dan. What a turnaround, indeed. I can picture you serving very well in that role, Audrey. You have a spiritual quality that is always present in your writing. Thank you for spending some time here today. Thank you, Dan. Enjoy your weekend. Beautiful post and tribute, Dan. Love this post, Dan! What a history you have shared and the legacy your mother left you. Your mom looks very sweet in that last picture. Thank you. She was a member of that church for over 75 years, and she was attending before joining as a junior member. A beautiful and touching tribute Dan to your Mom, Grandmother, and Aunts. The photos of the churches are lovely. Thanks Deborah. I could have just used a recording of the “Prayer and Praise” section of that service on Mother’s Day. Everyone there felt the same way. This is a beautiful tribute, Dan. Cherish indeed. TGIF hugs! Thanks Teagan. This was an easy one to figure out. What a lovely tribute to two great women in your life. And, a perfect subject for the Cherished Blogfest. I wasn’t raised in a faith but my mother certainly taught me right from wrong and gave me boundaries I still follow. Although she has been gone for 17 years, I still hear her voice in my head encouraging me to make good choices and do the right thing. I think those lessons are carved deep in our memory. They have served us well. Thanks for stopping by and taking the time to comment. Beautiful story, Dan, and St. George’s is pretty magnificent. It’s a beautiful church. I’ve never been inside the new one but I’m guessing it will be very nice. They may be gone but not forgotten. Lovely tribute, Dan, not only to these women who were a big part of your life but to all women, educated or not, who teach their sons and daughters the difference between right and wrong, good and bad. Thanks Evelyne. I think it is so often the mothers who teach those lessons. I remember men in both churches. They were mostly good men, fun to be around, and they taught us many things, and they were mostly good examples, but not like these women. Lovely to read! I’ve been told too that women leave a bigger impact on children. I think it’s maybe less true now with younger dads being great role models too. In any case your homage was great. Thanks John. It runs through midnight Sunday if you get some free time. I did a poor job of advertising this. I’ve been very busy and the date snuck up on me. Thanks Ruth. I don’t have many good pictures of her and I or even just her. I’m glad I asked my brother to take one. “The Old Rugged Cross” was my mom’s absolute favourite hymn and was played at her funeral. It’s one of my favourites too, but it’s one that makes me cry every time I hear it, even to this day. Thanks for unapologetically speaking the name of Jesus in this one, Dan. I wish people did more of that. And God bless your mom and grandma for never being ashamed of Him. Thanks Wendy. The Old Rugged Cross was my grandmother’s favorite hymn. My mother did not inherit that appreciation . She also did not like my favorite hymn: “Amazing Grace.” I remember my grandmother’s funeral. The minister, when talking about Rachel, said: “And we all know how Rachel loved her Jesus…” We cultivated that relationship in that small church. I’m glad you liked this. How curious that she didn’t care for “Amazing Grace” either! That’s my favourite also (and my dad’s too). “And we all know how Rachel loved her Jesus…” I love how he put that. “Amazing Grace” seems to be one of those songs that you either love if you don’t want to hear. Someday, I have to tell the story of why it’s my fav. When we were making preparations for her funeral, they asked about her favorite hymns. We didn’t know, we only knew the ones she didn’t like. We asked around her church and everyone said “just not…” and listed those two. Nice post, Dan. What a blessing it is to have faith-filled parents and grandparents to guide us as we grow up. I can think of quite a few in my family, all of whom helped shape me in a number of ways. It’s vital that we cherish those memories and — more importantly — to live by the words and example they gave us. Thanks Paul. There were all good examples, and they were vigilant in keeping us on that path. They’re long gone, but their memory still reminds me of the right things to do. We are lucky to have had people like this in our lives. Thanks Christine. I guess these small towns and small churches dot the landscape throughout the country. It’s funny that you mention calling people aunt and uncle (out of respect). I grew up thinking our family was much larger than it is. We spent a lot of time in those churches. I guess it helped. Thanks Amy. I am still looking for the right church, the church to replace the experience I remember. I hope you find a place where you guys can be comfortable. I’m glad no one was hurt in that accident. That’s all that matters. I wish you all the best in finding that church, Dan. I understand disappointment. Our motivation has been renewed to again seek. And yes all that matters is no one was hurt in that accident. I love this tribute Dan! I’m sure all of these women of faith are proud of you and your writing! Thanks Emily. I would like to think those women are proud, or at least happy. A beautiful tribute with great photos. Thanks for sharing. Your mom sounds like a very special person who left an indelible mark on you. I love the photo of you together. It seems like I don't have to wish it for you … your memories will always be heart-warming! Beautiful post Dan and I love that photo with your Mom. Thanks Norm. I’m so glad I had my brother snap that photo. That’s a moving tribute. What a beautiful share for the Cherished Blogfest! Thanks Damyanti. These women were all special to me. Finally, I am back on your site after a really long time. Don’t ask how my days are turning up. Sometimes I feel 24 hours are not enough for me. Anyways, I will rant about my busy schedule some other day. Back to your Cherished Blogfest post, I am already quite emotional reading various posts before you. Mary wrote about her late friend, you wrote about your mother and granny and in just two days (18th Oct) it will be 22 years that my mother is gone. I believe by now you already know how close I was to my mother. She was my world and whatever I am today is because of her. She taught me a lot of things but above all, she taught me to never give up. She was a fighter but she never revealed her scars to me, maybe I was too naive to understand what she was going through. However, whenever I was down she would back me up to do it again. In fact, after she was gone I was lonely and a lot of people took advantage of me because I was scared to face the world alone. However, it was her legendary words that put me back on track. You know what she once said to me? She said: It’s a dog eat dog world out there. So stop whining and barking, start biting. I think a parent’s first instinct is to see their children be taken care of or be able to take care of themselves. Sometimes, their are hard lessons involved in that process, but that’s part of the job we accept when we have children. When I was growing up, there was much more of a community spirit around raising children. It was like we were all part of an extended family, especially in that small church. I think your mom did a good job! That was a beautiful tribute about the special women in your life, Dan! I’m so glad you shared their story with all of us here at the Cherished Blogfest! Thank you Esha. It was good to be able to mention them. I’d like to think they all knew how much we appreciated their looking after us. I am just now finding time to read the posts. This one brought up the things my mom and my grandmother did for me, including pass on their faith, and even though I am now a Buddhist, I have the teachings and the heart connection to both Catholics and Methodists… Guadalupe and my gandmother’s reasons for believing in God. Thank you — and lovely pic of you and your mom! I’m glad you had a chance to read this Kate. These women were all so important to me when I was growing up. Ow did I miss this? Last week was such chaos. Oddly (or not) The Old Rugged Cross is my very favorite hymn of all…..I love that photo of you and your Mom. My grandmother loved that hymn. I remember her singing it. I am so glad I asked my brother to take that photo. Thanks Donna. I always focused on the differences, mainly because my mom was always saying stuff like “I don’t have a clue what you do…” The technology has just changed so fast. But the fundamental lessons were very similar. This is a lovely post to the those who helped make you who you are today. So easy to forget how different their lives were from ours, yet you’ve captured that idea here beautifully. Thank you Ally. They dealt with so much in their lives, their faith kept them going, and they did their best to pass that onto us. I enjoyed reading this post Dan, its so nice to acknowledge and appreciate women of faith, your mom and your grandmother lived by example and have influenced you positively. You reminded me of my parents who were traditional Catholics but with deep faith in God and they taught us to pray every day and told us to trust in God at all moments of our lives. Thank you for sharing! Thank you. I’m glad you enjoyed this. These women could point to the times when their faith sustained them. I can too, but that’s to their credit. By and large, they lived a life that was governed by their faith. What a lovely post of some very cherished ladies who shaped your life. I like the photos you included, especially the ones of the churches. It’s always interesting to take a peek inside and see what other churches look like.